Have you ever wanted to do something big? That’s me…holding…yes, you guessed it…MY RECORD! 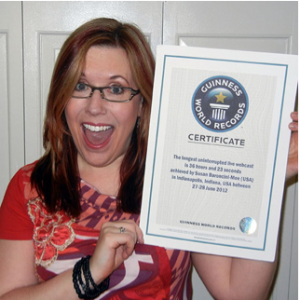 I’m Susan Baroncini-Moe, and I am the current Guinness World Records® title holder for the world’s longest uninterrupted live webcast. Since breaking the world record, I’ve signed a book deal (my book came out in June), had a massive surge of interview requests, and gotten loads of new clients. My business skyrocketed when I did something big. That can work for you, too, and you don’t have to break a record to do it. Ever since I broke the world record, so many people have been asking me how I did it (and wanting the specifics) that I finally decided to teach a masterclass on how YOU can break a world record (or do something else equally herculean and massive and awesome). But WHY do something so big? 1. Doing something big is a great way to grow your business and make a name for yourself. After I broke the world record, I signed a book deal and a ton of new clients. My subscriber list grew by leaps and bounds, and I had more opportunities than I knew what to do with. Still do. It’s the gift that keeps on giving. And you don’t have to break a world record to do this. You can do something else that’s big! When all is said and done, I want to look back on my life, I want to have done something big. Don’t you? 3. I’m now the Queen of All Webcasts and Webinars. What do you want to dominate? Not bad, right? What do you want to rule? Because sure enough, if you break a world record or do something else that’s major, you’ll dominate that thing. Seriously, if you want people to know your name, if you want people to sit up, and take notice, and recognize you a serious mover and shaker who can get things done, then this is the class for you! If you want to make your mark and do something that’ll be remembered, so that you get to do more of what you love, then you won’t want to miss this one-time-only, live, web-based masterclass. If you want to do something big that’ll grow your business, change your life, spark a movement, or make a name for yourself, you’ll want to take this masterclass to find out exactly how to do it. How to face any fears of doing something big and take the leap. How to come up with your big idea. How to apply to Guinness World Records and get their approval (if a world record is your thing). How to plan, organize, and execute a big project in a short period of time without losing your mind. How to get your entire project funded by sponsorship dollars. Join me for this one-time-only masterclass and I’ll show you how to make a name for yourself and grow your business with one big, awesome project, whether it’s breaking a Guinness World Record or something else. *Hey. You, there. What are you DOING? Why are you still reading? Take the masterclass right now, silly! You’ll get immediate delivery!